Measurement Systems offers a wide range of data logging solutions. From low cost single channel data loggers for a range of environments to fully featured SCADA data logging systems, measuring all types of parameters from pressure, temperature, humidity to USB connectivity. With more than 30 years experience in the industry we can provide assistance in the slection of the most appropriate product to meet your application and budget. In addition we provide product support, training and customisation, along with a money back guarantee. If you need any assistance in choosing the appropriate device for your specific application contact us. Datascan Instant incorporates distributed input output modules with SCADA software to offer a complete Data Acquisition Solution. The HOBO® range of Indoor loggers are battery operated loggers to monitor various parameters using internal or external sensors. Temperature and Humidity Data Loggers, single-use & re-usable, waterproof with alert LED's. Simple to configure and download using NFC Wireless, available in may modern Smartphones and tablets (USB-NFC interface also available). This range of products can be used for simple auditing to comprehensive monitoring and management of electrical energy and power. A complete range of temperature data loggers. From simple single channel units to powerful computer based multi-channel systems. This category contains multi-channel products which can be used in remote locations and transmit using the internet. Newsteo® Wireless Monitoring Solution, battery operated devices, transmitting to a local computer or gateway device for onward transmission to a networked server or hosted data solution. Alternatively can be used as easy download data loggers. A range of Dataloggers designed for use in outdoor or environmentally challenging applications. 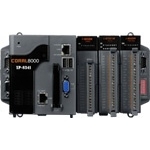 The flexibility of a rugged compact industrial computer with the power of SCADA solution. Expandable and fully configurable. Data Logging, monitoring and control.